"We all trust software. All too frequently, this trust is misplaced. Larry Bernstein has created and applied quantitative techniques to develop trustworthy software systems. He and C. M. Yuhas have organized this quantitative experience into a book of great value to make software trustworthy for all of us." Trustworthy Systems Through Quantitative Software Engineering proposes a novel, reliability-driven software engineering approach, and discusses human factors in software engineering and how these affect team dynamics. This practical approach gives software engineering students and professionals a solid foundation in problem analysis, allowing them to meet customers' changing needs by tailoring their projects to meet specific challenges, and complete projects on schedule and within budget. Specifically, it helps developers identify customer requirements, develop software designs, manage a software development team, and evaluate software products to customer specifications. Students learn "magic numbers of software engineering," rules of thumb that show how to simplify architecture, design, and implementation. Case histories and exercises clearly present successful software engineers' experiences and illustrate potential problems, results, and trade-offs. Also featuring an accompanying Web site with additional and related material, Trustworthy Systems Through Quantitative Software Engineering is a hands-on, project-oriented resource for upper-level software and computer science students, engineers, professional developers, managers, and professionals involved in software engineering projects. 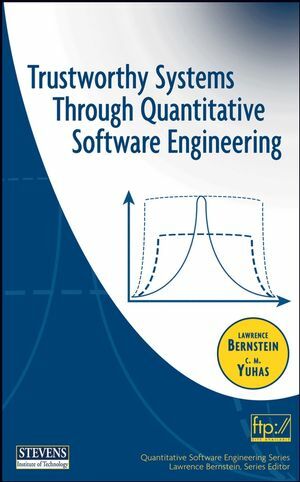 LAWRENCE BERNSTEIN is the Series Editor for the Quantitative Software Engineering Series, published by Wiley. Professor Bernstein is currently Industry Research Professor at the Stevens Institute of Technology. He previously pursued a distinguished executive career at Bell Laboratories. He is a Fellow of IEEE and ACM. C. M. YUHAS is a freelance writer who has published articles on network management in the IEEE Journal on Selected Areas in Communication and IEEE Network. She has a BA in English from Douglass College and an MA in communications from New York University. 1. Think Like an Engineer—Especially for Software. 1.2 The Software Engineer's Responsibilities. 1.5.1 No-Method "Code and Fix" Approach. 1.5.3 Spiral Method: Planned Risk Assessment-Driven Process. 1.5.5 Planned Incremental Development Process. 1.5.6 Agile Process, a Apparent Oxymoron. 1.6 Re-emergence of Model-Based Software Development. 1.9 Principles of Sound Organizations. 1.10 Short Projects-4 to 6 Weeks. 1.10.1 Project 1: Automating Library Overdue Book Notices. 1.10.2 Project 2: Ajax Transporters, Inc. Maintenance Project. 2. People, Process, Product, Project-The Big Four. 2.1 People: Cultivate the Guru and Support the Majority. 2.1.1 How to Recognize a Guru. 2.1.2 How to Attract a Guru to Your Project. 2.1.3 How to Keep Your Gurus Working. 2.1.4 How to Support the Majority. 2.3.Process: "OK, How Will We Build This?". 2.4 Project: Making It Work. PART 2: ETHICS AND PROFESSIONALISM. 3.1 What Can Go Wrong With Requirements. 3.6 Quantitative Software Engineering Gates. 3.8.2 Using the ICED-T Model. 3.9 Development Sizing and Scheduling with Function Points. 3.9.1 Function Point Analysis Experience. 3.9.2 NCSLOC vs Function Points. 3.9.3 Computing Simplified Function Points (sFP). 3.10 Case Study: The Case of the No-Show Service. 4.1 Make It Work; Then Make It Work Right. 4.1.1 How to Get at the Governing Requirements. 4.1.3 What's Soft is Hard. 4.2 So What Happens Monday Morning?. 4.2.1 What Needs to Be Prototyped?. 4.2.2 How Do You Build a Prototype?. 4.2.3 How Is the Prototype Used?. 4.2.4 What Happens to the Prototype?. 4.3 It Works, But Will It Continue to Work?. 4.4 Case Study: The Case of the Driven Development. 4.5 Why is Prototyping So Important?. 4.8 Case Study: The Case of the Famished Fish. 5.1 Architecture Is a System's DNA. 5.2 Pity the Poor System Administrator. 5.5.3 Ready or Not, Objects Are Here. 5.7.5 Industry Support of TL1. 5.8.1 Diary or Log Document. 5.8.3 Users of Architecture Documentation. 5.11 How Many Times Before We Learn?. 5.11.1 Comair Cancels 1,100 Flights on Christmas 2004. 5.11.2 Air Traffic Shutdown in September 2004. 5.11.3 NASA Misses Mars, 2004. 5.11.4 Case Study: The Case of the Preempted Priorities. 5.12.2 Product-Related Layer in the Architecture. 5.13 Design and Architectural Process. 6. Estimation, Planning and Investment. 6.2.1 Fundamentals of Function Point Analysis. 6.2.3 Objectives of Function Point Analysis. 6.2.4 Characteristics of Quality Function Point Analysis. 6.3 Five Major Elements of Function Point Counting. 6.3.4 Internal Logical File (ILF). 6.3.5 External Interface Files (EIF). 6.4 Each Element Can Be Simple, Average or Complex. 6.5 Sizing an Automation Project with FPA. 6.5.1 Advantages of Function Point Measurement. 6.5.2 Disadvantages of Function Point Measurement. 6.5.3 Results Common to FPA. 7.3.1 Topics for the Design Review. 7.3.4 Software Structure Influences Reliability. 7.3.6 Open & Closed Principle. 7.3.7 The Liskov Substitution Principle. 7.3.8 Comparing Object Oriented Programming with Componentry. 7.6 Design Constraints That Make Software Trustworthy. 7.6.4 Hire Good People and Keep Them. 7.6.5 Limit the Language Features Used. 7.6.6 Limit Module Size and Initialize Memory. 7.6.7 Check the Design Stability. 7.6.8 Bound the Execution Domain. 7.6.9 Have Performance Budgets and Engineer. PART 3: TAKING THE MEASURE OF THE SYSTEM. 8. Identifying and Managing Risk. 8.3 Functions of Risk Management. 8.6 Using Risk Assessment in Project Development: The Spiral Method. 8.7.1 Incomplete and Fuzzy Requirements. 8.7.4 Morale of Key Staff Is Poor. 8.7.5 Stakeholders Are Losing Interest. 8.7.7 Feature Set Is Not Economically Viable. 8.7.8 Feature Set Is Too Large. 8.7.10 Late Planned Deliveries of Hardware and Operating System. 8.8 Manage the Cost Risk to Avoid Outsourcing. 8.8.4 Integration, Reliability and Stress Testing. 8.8.6 Human Interaction Design and Documentation. 8.9 Software Project Management Audits. 8.11 Risks with Risk Management. 9. Human Factors in Software Engineering. 9.1 A Click in the Right Direction. 9.2 Managing Things, Managing People. 9.3 FAA Rationale for Human Factors Design. 9.4 Reach Out and Touch Something. 9.5 System Effectiveness in Human Factors Terms. 9.5.1 What to Look for in COTS. 9.5.2 Simple Guidelines for Managing Development. 9.6 How Much Should the System Do?. 9.6.2 Short- and Long-Term Memory. 9.8 Pleasing the Client by Pleasing the Developers. 9.9 The Bell Laboratories Philosophy. 9.10 So You Want to Be a Manager. 10.2 Rational Unified Process and Unified Modeling Language. 10.5 A Must Read for Trustworth Software Engineers. 11. Testing, Manufacturing and Configuration Management. 11.1 The Price of Quality. 11.2.4 Orthogonal Array Test Sets (OATS). 11.4 Case Study: Web Time Charging System (TCS). 11.7.2 Test Under No Load. 11.7.3 Test Under Medium Load. 11.7.4 Test Under Heavy Load. 11.7.6 Test the Error Recovery Code. 11.11.3 Meaningful Test Process Metrics. 12. The Final Project: By Students, For Students. 12.1 How to Make the Course Work for You. 12.2 Sample Call for Projects. 12.3 A Real Student Project. 12.4 The Rest of the Story.